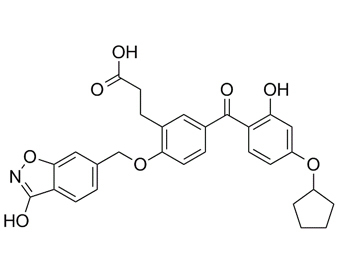 T-5224 is a selective inhibitor of c-Fos/activator protein-1. T-5224 ameliorates liver injury and improves survival through decreasing production of proinflammatory cytokines and chemokines in endotoxemic mice. T-5224 has been investigated in phase II human clinical trials. T-5224 may be a promising new treatment for septic kidney injury. Activator protein 1 (AP-1) is a pivotal transcription factor that regulates a wide range of cellular processes including proliferation, apoptosis, differentiation, survival, cell migration, and transformation.
. Uchihashi S, et al. Metabolism of the c-Fos/activator protein-1 inhibitor T-5224 by multiple human UDP-glucuronosyltransferase isoforms. Drug Metab Dispos. 2011 May;39(5):803-13.
. Miyazaki H, et al. The effects of a selective inhibitor of c-Fos/activator protein-1 on endotoxin-induced acute kidney injury in mice. BMC Nephrol. 2012 Nov 23;13:153.
. Izuta S, et al. T-5224, a selective inhibitor of c-Fos/activator protein-1, attenuates lipopolysaccharide-induced liver injury in mice. Biotechnol Lett. 2012 Dec;34(12):2175-82.